Thai sweet sticky rice with mango is a marketplace favorite and not to be missed if you visit the country! If you take a trip to Thailand don't miss this very popular hawker (marketplace) Thai food! A very sweet treat you'll absolutely love. 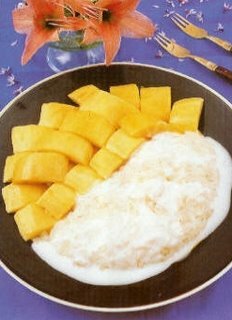 Be sure to start sticky rice with a mango that's nice and ripe, with a slight gives to the touch. The flesh should be bright and yellow. Although it's a dessert recipe, this is very filling and could be served as a main course. The Sticky rice with mango is optional. It’s easy for Thai vegetarian cooking. This menu is use for period Kin Jay festival. 1. Prepare the 2 cups sticky rice as per our detailed instructions. While sticky rice is steaming, mix together 1.5 cups coconut milk, 1 cup sugar, 1/2 teaspoon salt and bring to a boil. 2. Set aside to cool (for a more fancy preparation, you can strain the coconut milk in a cheesecloth before setting to cool, but this is not necessary). 3. Immediately after sticky rice is cooked and still hot, put it into the coconut sauce and stir together well. Cover for 1 hour and let cool. Enjoy your cooking for vegetarian Thai dessert.